The previous generation of Swift Conquerors had much to shout about when they were launched; distinctive silver sides, and the first to have a sunroof. However, as the Challenger SE pushed further upmarket, and then the Elegance was introduced, the Conqueror found itself being squeezed from both sides. Clearly Swift must have been aware of this, because for 2016, the Challenger SE has been dropped, and the Conqueror has been given the Elegance’s SMART HT bodyshell, but without some of the Elegance’s bells and whistles. The 650 is a new model for 2016. It has a rear bedroom which is accessed through his ‘n’ hers doors via the centrally located washroom. There are benefits to this, not least that any occupants of the front bed can access the washroom without disturbing those in the fixed bed. And to see other Swift caravans for sale, click here. The Swift Conqueror 650 is a substantial caravan, so will need a hefty tow car to pull it. Kit wise, it pretty much lacks for nothing. Al-Ko running gear with ATC stability control, an AKS stabiliser, heavy duty (easily accessed) corner steadies and a button-less handbrake get things off to a good start. There’s even a small spirit level on the front shelf borrowed from the Elegance to help get the van level. All the major services are sensibly located on the offside, away from any awning, with a gas barbecue point and mains socket on the nearside. A solar panel helps keep the battery topped-up when away from hook-up. Thule bike rack mountings and easy access electrical control with the Swift Command App remote control completes the set-up. Although not huge, the lounge is pretty spacious, and would easily accommodate four people. The offside seat is significantly longer than that on the nearside, and helps the feeling of spaciousness. During the day, the area is flooded with light, thanks to numerous windows, a wide sunroof and a midi-Heki; helped too by the light coloured furnishings. Plenty of LED lights keep the place well lit when it’s dark outside too. The TV either sits on a narrow shelf or is mounted on a bracket just inside the entrance door. The two-tone gloss woodwork on the lockers leaves you in no doubt that this is an upmarket caravan. If we do have a slight gripe, it’s that the main table is stored in the bedroom. As to be expected at this level, the Swift Conqueror 650's kitchen is very well equipped indeed, with a dual-fuel hob, a separate oven and grill, a microwave (1.48m above the floor), an Omnivent and a 190-litre fridge-freezer, which is housed on the nearside, opposite the main kitchen unit. Not only is there everything for the chef, but it looks very smart too. Although there’s not a huge amount of work surface space, a removable drainer and fold up extension do help. Dark coloured, scratch-resistant ‘Fenix’ worktops and a snazzy back-lit splashback really complement the ‘Aralie Sen’ woodwork. Storage is also great here, as there’s a huge drawer and a pair of good-sized cupboards (one shelved, the other with pull-out baskets) under the sink, and two overhead lockers. Despite having three entrances, the washroom is very well equipped and spacious. In reality, the washroom is mainly where the 650 gains over its single-axle sibling, the 560. A large mirror with a narrow cupboard underneath face you when you enter from the kitchen. To the left is a corner mounted washbasin, again with a cupboard underneath and a mirror above. Next to this is the toilet, electric flush, of course. To the right is a very smart looking, fully-lined shower cubicle. Thoughtfully, a towel ring has been placed above an Alde radiator. An opaque window and pop-up rooflight take care of ventilation, whilst numerous lights ensure that the room is well-lit too. The lounge converts into a decent sized (1.98m x 1.15m) double bed, and the offside sofa could be used as a single at 1.88m x 0.68m. However, the nearside is only 1.52m long. The rear bedroom is the main feature of the Swift Conqueror 650. You enter from the washroom via one of two 'his ‘n’ hers' sliding doors, where you’ll find the fixed island bed with its head on the rear wall. Oddly, the bed retracts, but we can’t see a purpose for this as there’s no room (or reason) to walk across the foot. Having a bulkhead at the foot of the bed means that a TV point and bracket can be mounted there. Padded wallboards either side of the windows are a nice feature. All in all, a cracking bedroom. Bearing in mind that the 650 is most likely going to be used by couples, even if you do take a spare kitchen sink, you’ll probably still end up with some empty cupboards! There are three overhead lockers, two drawers and a drop down flap in the centre chest, and under-seat storage on the nearside in the lounge alone. Add to that the storage we’ve already mentioned in the kitchen unit (plus another four cupboards around the fridge-freezer), and you’ll see what we mean. Move into the bedroom, and you’ll find his ‘n’ hers wardrobes, with a drawer and cupboard under each, and another pair of overhead lockers. That’s before we mention the space under the bed. You’ll need to take care not to overload. 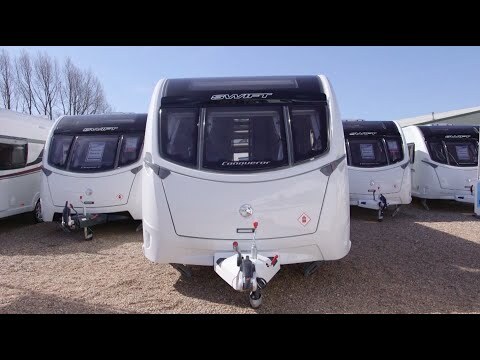 There’s no doubt about it, the Swift Conqueror 650 is one seriously good looking caravan, and where previously it had the Challenger SE knocking on its door, the Conqueror is now arguably knocking on the Elegance’s door. There are very few compromises with the 650; perhaps the slight lack of kitchen work surface being the main one. The lounge is sufficiently spacious and airy, and the bedroom and washroom are pretty much the height of luxury for a caravanning couple. Using Swift’s SMART HT construction methods should ensure that the 650 will be durable too, and we think that it’ll still look fresh a good number of years hence. If your budget and tow car match, then the 650 has to be worth a look.